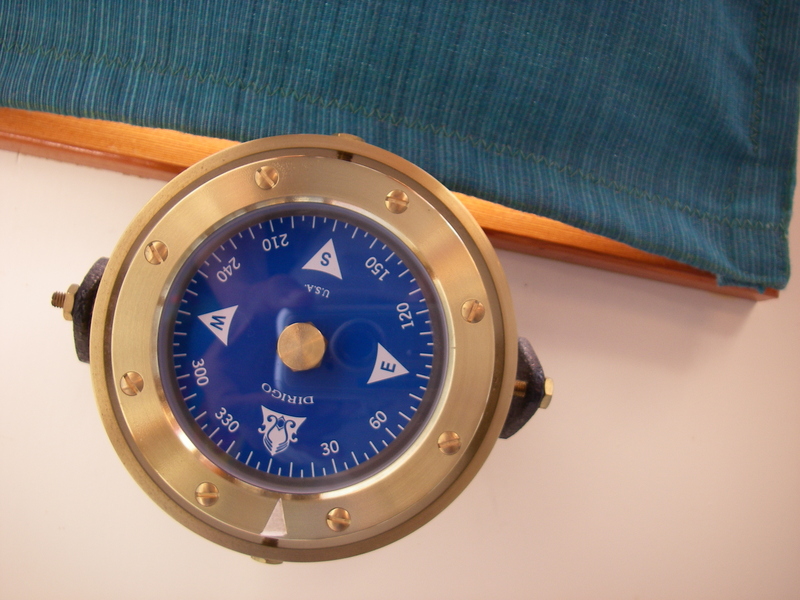 A telltale compass is designed to be mounted overhead, and read from underneath. The idea is to mount it over your berth, so that the heading of the boat can be easily checked, whether at anchor or underway. I gazed at one of these, in a catalog, for years. They’re not cheap, and there seems to be no such thing as a lightweight, less fancy plastic version, at least that I could find. A couple of years ago, in the middle of the winter with my birthday coming up, I was encouraged to go ahead and get that nice brass version, to put in the Chebacco. That encouragement was all it took, and it was my birthday present to myself, for the grand old age of 55. The next summer we mounted it in the boat, and I’ve been blessing it ever since. At anchor, it’s nice to be able to look up, and see if the boat has swung to a new direction with the change of tide. This lets you know that it’s a good time to sit up and look out the windows, to check that the anchor is indeed holding in the new direction. Having the telltale compass, there is no need to sit up just to find out whether or not the boat has swung, or to go through contortions to read the kayak compass that I used to set on the head cabinet for the same reason. Underway it’s even better. When the boat is being steered by the autopilot, or by the adjusted sails, it’s easy to keep tabs on how that’s going, moment to moment. When resting, out to sea, the telltale compass is particularly helpful. If the autopilot is struggling, it’s easy to know way before the characteristic sounds of a wandering course become obvious. Steering with the sails, there are even fewer auditory cues before things go completely to bits, with unintended tacks or gybes. Keeping track by just looking up at the compass goes a long way toward preventing all of that, as well as providing assurance that the boat is generally on course, in a safe direction. One of these days I will be sailing with crew again, and it will be nice to be able to check on progress in that situation in the same way. It’s important to say here that distance single-handed sailing, involving resting without keeping a proper visual watch on deck or out the windows, is not the best of good seamanship. A telltale compass is no substitute for keeping a proper watch, and neither are the electronics mentioned in the previous post. Compromises are made, in the process of resting while sailing single-handed. One does one’s best to minimize the additional risks, but I’m not here to recommend the practice. There are plenty of other people sailing distances alone, and the benefits are compelling, for those who are drawn to it, but there’s no arguing that it’s really a good idea. Still, good equipment helps. This compass has made a real difference, for me, in this process. The one shown in this link has a beautiful black and white card, but the one I received has a blue card with much plainer white printing. I’m aesthetically disappointed, but it works just fine, and perhaps they did it that way because it is indeed easier to read. The compass comes with no index mark, I assume to provide flexibility with mounting. I tried using it for a little while just trying to line up the degree markers generally, to the gap between the screws in the mounting ring, but the results felt fuzzy indeed. A little while later I cut a triangular pointer out of a piece of masking tape and stuck it on, aiming for a position parallel to the centerline of the boat. It was quite striking, what a difference it made in being able to identify just the heading that the boat was on. The light color of the masking tape shows up fairly well in the dark, and though I had ideas that it was just temporary, to try out the idea, it’s working just fine and is likely to stay. The black bracket is actually bronze, which we confirmed when drilling larger holes for 1/4 inch screws for mounting. 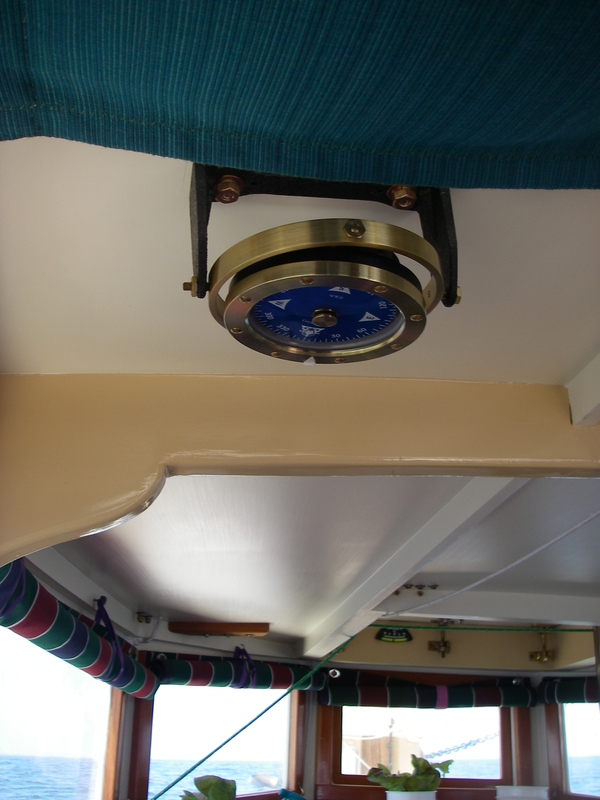 We through-bolted the bracket, using flathead machine screws through the top of the cabin. The originally provided holes in the bracket allow for fasteners that seem rather small, for something so heavy positioned right over your sleeping self. That’s about it, for this handy piece of equipment. Somebody looking for a business opportunity could probably make out quite well producing a less fancy version of telltale compass. Sailors (and power boaters for that matter) with any kind of sleeping accommodations could make very good use of it. In the meantime, there’s the beautiful brass version, and I’m ever so happy that it’s now part of this boat. I’ve heard some sailors use a dot of glow-in-the-dark/white nail polish in lieu of the masking tape. Comes in handy all over the boat, too. Oh that sounds good – even better, here, for the cockpit compass, where the numbers are lit. Thanks so much!